Kissimme, Florida - February 18, 2013 - UFP Technologies, a producer of custom-engineered components, products, and specialty packaging, will be exhibiting at South Pack 2013 March 6-7th, 2013 in Orlando, FL at the Orange County Convention Center. Our booth location for this year's event is #1337. Our facility in Kissimmee, FL, not far from the Orange County Convention Center, services not only Florida but much of the south east market for UFP Technologies. 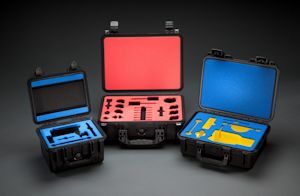 Our Florida foam fabrication facility primarily manufactures custom foam case inserts for protective cases, tool control, and protective packaging; and is ISO 9001: 2008 certified.